I can't make up my mind if this is cool or dumb. It's a bike bottle with a big groove removed so it can help hold extra stuff. I don't know that I'd necessarily put my phone on it because, well I've learned recently that should your phone accumulate one molecule of water on the secret test-dot hidden by the battery, you have voided your warranty, but that's for another post. But I frequently find that my bike bag is filled so much so that I can't get anything else in there, and I'm not carrying anything more than standard stuff. (One tube, co2 supplies, patch kit, a few bandaids, that kind of thing). And I particularly can't stand to have my jersey pockets filled with crap. I also have a bento rim bag, but it scrapes my knees when I stand to climb. My vote here is for "dumb". Here's why. First, the cutout's not that big, so you're going to have to put items on there that you can smoosh and/or wedge into the space of the bottle cage. You'll notice that the bottle with the C02 isn't actually in a cage—I'm pretty sure that's because it won't actually fit. Second, reaching down and getting a water bottle's distracting enough, and in times it can be downright dangerous. The last thing you need, when driving in traffic, is to reach for your bottle to have something fall off, or to grab it in such a way as it easily slips from your hand. I gotta imagine that having a tube strapped to your bottle won't make it easier to hold, and you really don't need to drop something like your phone along with a bottle. Nor do you need the swerving caused by trying to jam a bottle with now-unstrapped tube into place. Finally, one of the primary functions of a water bottle is that it squeezes to help produce a flow of water. 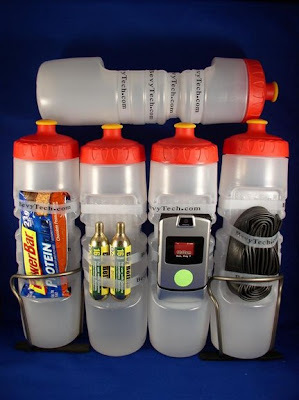 It's going to be really awkward to squeeze your phone/co2/tube/powerbar and bottle at the same time. If your bag, which is designed to hold items, doesn't hold them all, you should think about getting a bigger bag, or a bag that's got a zipper on it to allow it to expand on those trips when you pack more. This is something the old people in Florida would love. I also use up all the colored wrist bands laying around my house, my kids think the bottles look cool with red, pink, yellow and blue wrist bands when they take their snack bars to school on the bottle. If you have any questions please call 509-590-2223. I hope you and your blogger friends have a super safe cycling year. Cheers,Steve Lach a cyclist that likes music without headphones and gets a lot of calls from his kids. I forgot to mention, the top is great, a lot of flow, not much squeezing is needed. If you know David I welcome a call from him too. Hey Steve, thanks for posting! It's very cool to hear from you! Yes, I do know David, I'm sure he'll read your post here. He's addicted to my blog. I have a friend (Maria!) who gets a bunch of calls from her kids while riding. Maybe this bottle would be perfect for her! I'm a ride leader for the Rockland Bike Club (David's the president). I'd be interested to hear what members of the club would think of the Gadget Bottle. If it would get Maria to ride more, I'd buy her ten! Steve, I just left a message- I'd be happy to show a bottle to our club. Post here if you didn't get the message, I'll email my address. I'm excited to hear what people think! Sorry for my delayed response- I've been wrapped up with my sister in the hospital. Yes, I got the bottle and I tried it on a ride. I'm bummed to report that I didn't love it. I put my Envy phone into the straps and off I went. I found I was scared to drink because I sometimes drop my bottle when I'm drinking and I was afraid I'd ruin my phone. And this kind of phone opens sideways, so I couldn't really access it like you do with yours- I couldn't open it with the straps. Also, I ride a women's frame bike (so the inside triangle area is much smaller than a man's frame) and the extra long length of the bottle made it cumbersome to insert and remove it. Also because the buttons on my phone are on the outside, I couldn't squeeze the bottle to drink unless I wanted to call someone. So all in all, it didn't work for me. I'm still going to bring it to our meeting and let others give it a shot. Thank you for the opportunity to try it! Jenni, No need to apologize, it is not easy when a family member is in the hospital, I hope your sister is OK.
That was very useful info about the bottle. Since the weather in Spokane has not been good for cycling I have been going to the gym. At the gym many people tell me they like to strap their clunky key ring to it. The keys do not rattle on the exercise machine's console and they do not forget them. I actually started doing that, better than in my pocket. Also a few (Gym) people that do not ride, like the way it holds their phone. Not to answer it, but like not having the phone's weight in their pocket. Plus, they just like knowing who is calling. This use seems to be a growing theme for the bottle. One of my friends in Spokane rides a recumbent and uses an Envy. He likes the bottle because of the ease of access to his phone. I will have to ask him about squeezing. He actually purchased the first bottle from my site.